ikat bag: Old Friend! Old Friend! We are having a very busy February! Three big things are happening that need prep for. The first is Valentine's Day - and it is mainly for Emily's class activities that we will be prepping. The second is Chinese New Year. This is a 15 -day celebration, the first (and busiest) day of which falls on Valentine's Day this year. When this happens, it usually means that CNY prep overshadows V-Day prep- the baking alone begins weeks before the first day, not to mention the um.. spring cleaning that usually never happens in our house. We. Are. Going. To. Singapore. Today, 17F, blizzard, snowploughs, lizard skin, ski jackets. Next fortnight, 88F, 99% humidity, tropical island, warm swimming pools, ma's cooking. If we can survive the 20-something hour plane ride with three small children, I mean. So lots of prep for the trip - must pack a whole day's worth of entertainment for the plane ride, none of which can be pointy metal, which rules out ANY hand-sewing, GAH. And must quickly whip up (never mind if ugly) shorts, skorts and summer dresses for the girls since Target is still clearing its mittens and fleece pants. I'd whine more about the time pressure if I wasn't also secretly thrilled to be sewing summer (not even spring!) clothes in February. 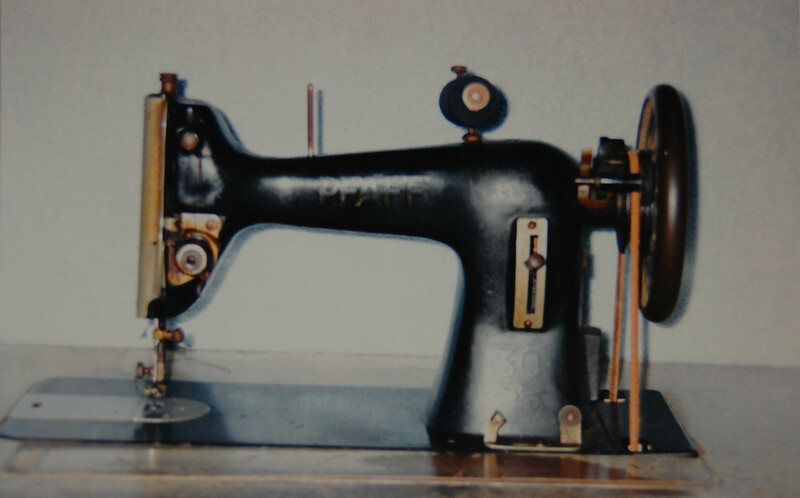 (she's a vintage Pfaff treadle, she can't backstitch to save her life, she runs on foot power, some gears and a leather cord and she sews like a dream). I almost got to ship her over here to the US last year but Dad said he wanted to keep her for his leather sewing. Sniff. It's always hard to share sewing machines with your father. Still, I anticipate overreacting and being a weeping idiot when we meet - and with Dad, too. Mum expressed disbelief when I said I was planning to sew summer dresses for the girls. "Where will you find the time?" she said. To which I snorted, "Ma! They're rectangles with elastic! And if I really don't have the time, I'll bring the fabric to Singapore and sew there!" I am giddy with hopeless optimism. All that to disclaim that there will probably be NO Valentine's Day crafts on this blog this year. No time! Well, maybe just one. Scroll to the next post to see my token V-Day craft offering! I live in Singapore, but am currently in the States. I made the trip with my two year old by myself about three weeks ago! Don't worry the plane ride it's worth it! How exciting!!! (Well, aside from the 20 hour trip with 3 small children.) Hope you all have a wonderful time! Question: how do you finish ends when sewing with a treadle machine that can't backstitch? Yay! Am looking forward to you guys coming back! When do you arrive? We MUST catch up! Have a wonderful time! I lived in Singapore for a few years way back when and cannot wait to bring my boys there someday! Have fun sewing summer clothes! lucky for you! how wonderful to visit with your parents and other family members. but don't forget about plastic sewing needles. they're the perfect size for yarn and can even punch through some plain burlap. a little sharpy outline and voila! a bit of introductory embroidery. Only my own skirt left! The Owie Doll Pattern is Here! Catch Me (and my Boy Pants) on Made By Rae!